Our Dentists, Oral Health Therapists and Hygienists cater for children’s dental needs. 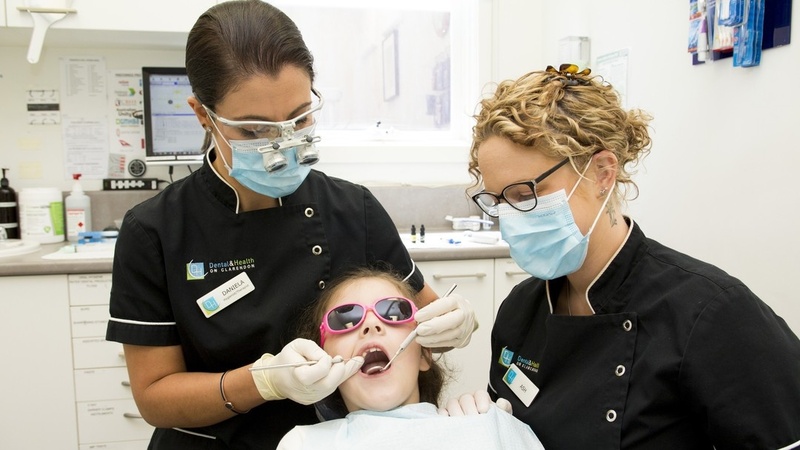 We are the preferred Dentists for many local children in South Melbourne, Albert Park, Middle Park, Southbank, Port Melbourne, St Kilda and surrounds. In fact, local families that have moved interstate or abroad continue to see us for their Children’s dental needs. Our friendly, caring and professional services ensure that children often see a visit to our practice as a fun experience. Parents can rest assured knowing our highly trained and qualified team can perform pain free general dentistry for kids to the highest standards of care. To prevent minor dental issues becoming big problems, we recommend you bring your children in for their first check-up before they reach 2 years of age, and subsequently booking in for a consultation every 6 months. This allows our Dentists to monitor your children’s oral health and tooth eruption patterns. It’s best if your children’s first experience occurs at a time before invasive work becomes necessary. Early check-ups make it easier to build rapport and establish trust with the dentist for future visits. To keep our patients smiling, we combine the latest pain-free technology, more than 20 years of experience and friendly advice for preventative care. The pain free dental technology at our South Melbourne clinic – including The Wand – ensures complete comfort right from the first check-up. The Wand allows us to administer anaesthesia without the pain typically caused by the pressure of the anaesthetic entering the tissue of the gum. The Wand treatment is delivered by our highly qualified practitioners and is safe for the whole family. Preventative care is available for all ages and includes a range of maintenance treatments and advice. Our friendly kids’ dentists will perform preventative treatments like professional teeth cleaning and provide advice for keeping up a good oral health routine. They will even help to educate children about dental care using positive, encouraging language that inspires them to be pro-active and enthusiastic with their dental care routine at home. We make it easy for children across South Melbourne, Albert Park, Southbank and beyond to keep their teeth healthy and strong! Our Dentist’s recommend your children are introduced to our dental practice from as early as their 1st tooth erupting in the mouth. Coming along to mum and dad’s visit is a great way to start getting your little one comfortable with visiting the dental team – A positive first visit can be the first step toward a lifetime of good dental habits! The visit would usually start with a ride in the dental chair and counting their teeth, checking the gums and sometimes being able to gently clean their teeth. Even very young children are perceptive and can pick up and react to any anxiety you might have about the upcoming visit. Arrange for a morning appointment if possible. Children are often more positive and receptive. Avoid talking about specific procedures or instruments, as these ideas may confuse or upset your child. Words like “drill,” “injection,” and “needle” are potentially very frightening to a child. Brushing your teeth has never been so fun! Colgate have lots of fun games, App recommendations (from the iTunes or Android stores) and activities to help educate kids on oral hygiene and have fun while doing it! Follow this link to make brushing fun with your favourite friends! We also accept all other health funds. At Dental on Clarendon we don't just treat our patients, we care for them. We strive to be the best dental practice in Australia by providing superior services and excellence in all aspects of cosmetic, general, pediatric and restorative dentistry. © 2019 Dental On Clarendon except where otherwise noted • Content and Search Marketing by Physicians Marketing Solutions, Inc.